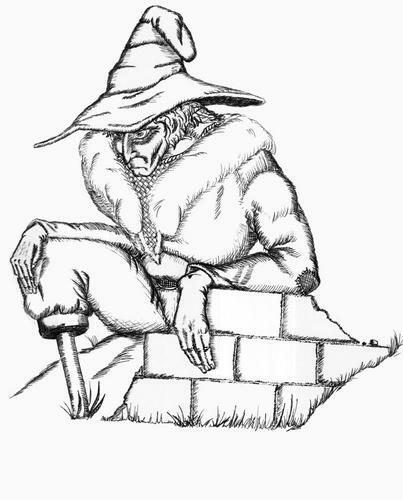 The pencil original featured a goblin-like figured hunched on a wall, poised to leap, but when I rushed to ink it I butchered quite a few lines and glossed over a great deal of detail, thus altering the overall composition. Although I am unhappy with the final result, I am amused at how particular errors drove me to make certain changes; for example, a misplaced wall meant that the figure could have at most one leg. Black rollerball over pencil on 9”x12” drawing paper.